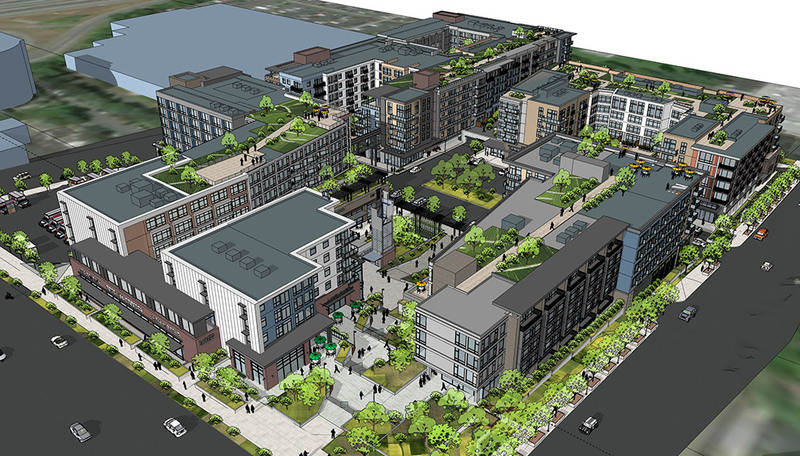 Madison Development Group and MG2 are planning a major mixed-use project with about 870 housing units over new retail on a nearly 7-acre shopping center in Kirkland. The 41-year-old mall at 12040 N.E. 85th St. is generally known as Rose Hill Shopping Center. It’s in the Rose Hill neighborhood, just east of Costco and Interstate 405. Tenants include Petco, Eastside Auto Licensing, Dollar Tree, Outback Steakhouse and Kirkland Autoworks. The 41-year-old mall is on a 7-acre site. MG2 is designing four mixed-use buildings for Madison Development Group. The L-shaped property hasn’t traded in decades. It doesn’t include the separately owned U-Haul site on the corner of 120th Avenue Northeast. The unnamed new project would comprise four five-story buildings, separated by landscaped pedestrian connectors and courtyards. Roof decks are indicated. Ground-floor retail would total about 84,200 square feet. The city says that 10 percent of the apartments will be affordable. Parking for 1,049 vehicles would be on two levels below grade, plus 64 short-term surface stalls. Total project size, including the parking, is about 1.3 million square feet. The 6.9-acre property apparently went on the market two years ago, unpriced, offered by Nicholas Gill of Westlake Associates. Zoning allows construction up to 67 feet. The seller is a California family. Kirkland’s design review board began considering the project in June, with the most recent meeting this month. The project will also need SEPA review. Kirkland-based Madison (aka MDG) has ample experience with mixed-use projects, though perhaps not on such a large scale. It’s currently developing 108 units over a new PCC at 2749 California Ave. S.W. Past projects, also in West Seattle, include the 72-unit Element 42 and 184-unit Spruce. MDG also developed the 211-unit Excelsior on Capitol Hill. Firm co-founder Tom Lee also had a role in the 237-unit Summit at Madison Park apartments, which has a Safeway and other retail. MDG also does retail and industrial development. The Rose Hill team also includes Barghausen Consulting Engineers, civil; WSP USA, MEP engineer; and Brumbaugh & Assoc., landscape architects. No general contractor has been named, and no start date has been announced. *Published in the Seattle Daily Journal of Commerce; written by Brian Miller.